Despite my enjoyment of the 2012 movie, “THE HUNGER GAMES”, I must admit that I had regarded its sequel, “THE HUNGER GAMES: CATCHING FIRE” with a wary eye. One, the movie franchise had replaced Gary Ross with a new director, Francis Lawrence. And two, a relative who had read all three of Suzanne Collins’ novels expressed a less-than-impressed opinion of the second installment, which this movie is based upon. But enamored of the first film, I decided to give this second one a chance. “CATCHING FIRE” picked up not long after the ending of the first installment. The winners of the 74th Hunger Games, Katniss Everdeen and Peeta Mellark, have returned to their homes in the impoverished District 12. But due to their winnings, both now reside in upscale neighborhoods. Before they are scheduled to embark upon their victory tour of Panem, Katniss receives a visit from the tyrannical President Snow, who reveals that her actions in the recent Games have inspired rebellions across the districts. He orders her to use the upcoming tour to convince everyone her actions were out of genuine love for Peeta, not defiance against the Capitol. The victory tour goes off well, aside from an emotionally difficult and violent visit to District 11, the home of the deceased tributes, 12 year-old Rue (whom Katniss had befriended) and Thesh (who had saved Katniss). Despite the tour and the installment of violent Peacekeepers in District 12 to crack down on any signs of rebellion, President Snow remains fearful of Katniss being used as a symbol of any possible upheavals. The new Head Gamekeeper, Plutarch Heavensbee, proposes a special Hunger Games called the Third Quarter Quell (the 75th Hunger Games), in which the tributes will be selected from previous victors. He believes the Games would either ruin Katniss’ reputation, or kill her. As the only female victor from District 12, Katniss is naturally selected. However, her mentor Haymitch Abernathy is chosen as the male tribute. Peeta immediately volunteers to take his place. Haymitch informs the pair that most of the tributes are angry over being forced to participate again and suggests they make alliances. Although Katniss is against the idea, she and Peeta adhere to Haymitch’s advice and find themselves in competition that ends with surprising results. Despite becoming a fan of “THE HUNGER GAMES”, I continued to resist watching Suzanne Collins’ novels. Perhaps one day I will read them. But due to my unfamiliarity with the plots, the end of “CATCHING FIRE” pretty much took me by surprise. And this is a good thing. The movie’s first third hinted of a growing rebellion against President Snow’s rule over Panem in scenes that included Katniss and Peeta’s harrowing visit to District 11, the beating of Gale Hawthorne (Katniss’ closest friend and possible lover) at the hands of the Peacekeepers, and Snow’s growing paranoia over Katniss. Even the scenes featuring Katniss’ participation in the 75th Hunger Games continued hint the growing rebellion against Snow’s administration and the Capitol through the characters like Haymitch, Katniss’ friend and costume designer Cinna, and those serving as tributes. Characters like Beetee Lasnier and Johanna Mason expressed their dismay or anger at being forced to participate in another Hunger Game during their pre-Game interviews with Caesar Flickerman. Even Peeta tried to manipulate Snow into stopping the Game with false hint that Katniss might be pregnant. And during the Game, I found it interesting that Katniss and Peeta ended up forming an alliance with Lasnier and his District 3 counterpart Wiress, Johanna, and the two tributes from District 4, Finnick Odair and Mags – the only tributes to express any hostility toward the Games and President Snow. I had figured that all of them would eventually openly defy Snow by getting out of the Games. But thanks to some very good writing from Suzanne Collins, along with screenwriters Simon Beaufoy and Michael deBruyn; the circumstances behind the beginning of the rebellion really took me by surprise. I understand that the song “Atlas”, written and performed by the group Coldplay have earned both Golden Globe and Grammy nominations. Congratulations to the band. However, I do not remember the song. Sorry. I simply did not find it memorable. I was also a little disappointed in how Lawrence (the director) seemed to rush the first third of the movie – namely the sequence featuring Katniss and Peeta’s victory tour and District 12’s problems with the so-called Peacekeepers that culminated in Gale’s beating. It seemed as if he was in a hurry for the movie to focus on the 75th “Quarter Quell” Hunger Games. And if I may be blunt, I was also not that impressed by Alan Edward Bell’s editing. It struck me as a little choppy – especially in the movie’s first half. The performances by the cast struck me as first rate. Jennifer Lawrence and Josh Hutcherson did superb jobs in continuing the development of their characters, Katniss Everdeen and Peeta Mallark. I noticed in this film that Lawrence conveyed a great deal of realism in Katniss’ growing difficulty in containing her emotions regarding those she cared about. This was especially apparent in the scene following Gale’s public whipping, Peeta’s near death experience during the first day of the Games and the visit to District 11. Someone once described Peeta as a saint. I never could view him in this manner. He strikes me as a rather manipulative individual, who can also be a very good liar. What is amazing about Hutcherson’s performance is that he perfectly balanced Peeta’s manipulative skills with his near all consuming love for Katniss and willingness to do anything for her. Liam Hemsworth got a chance to develop his portrayal of Katniss’ childhood best friend, Gale Hawthorne. Hemsworth, like Hutcherson, did an excellent job in balancing the different layers of Gale’s personality – namely his love for Katniss and his ever-growing obsession with rebellion against President Snow and the Capitol. Woody Harrelson continued to knock it out of the ballpark as Katniss and Peeta’s alcoholic mentor, Haymitch Abernathy. I think this is the first time moviegoers got a real look at Haymitch’s hostility toward President Snow, especially in the scene which featured the announcement of past winners participating in the Quarter Quell. 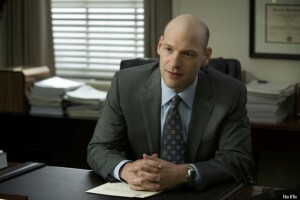 Harrelson portrayed that small moment with such intense anger. Donald Sutherland continued his brilliant portrayal of the brutal, yet manipulative politician, President Coriolanus Snow. Sutherland perfectly captured Snow’s quiet machinations that could rival Palpatine from the STAR WARS franchise. Yet, the actor also did a subtle job in conveying Snow’s growing paranoia over Katniss’ popularity and growing role as a symbol of rebellion. I had greatly enjoyed Elizabeth Banks’ performance as Effie Trinket in the first movie. I loved her performance in this film, as the actress allowed filmgoers a deeper look into the chaperone’s persona, beyond her usual shallowness. I am also happy that Lenny Kravitz reprised the role of Cinna, Katniss and Peeta’s stylist for the Games. As usual, the actor/musician gave a warm and beautiful performance as Katniss’ emotional solace before the Games. One particular scene in which Cinna endured a brutal beating over a dress he had created for Katniss proved to be a very painful one to watch, thanks to Kravitz and Lawrence’s performances, along with the other Lawrence’s direction. Stanley Tucci was marvelous as ever in his continuing portrayal of Caesar Flickerman, the Games’ announcer and commentator. Toby Jones reprised his role as Flickerman’s fellow commentator, Claudius Templesmith. But his role had been reduced considerably. The movie also featured some newcomers to the franchise. Philip Seymour Hoffman gave a sly and subtle performance as the Games’ new Head Gamemaker, who schemes with President Snow to destroy Katniss’ reputation and possibly, her life. Sam Claflin continued to surprise me at how charismatic he could be, in his engaging portrayal of Finnick Odair, one of the tributes from District 4, during the 75th Games. Jena Malone was a hoot as the outspoken and aggressive female tribute from District 7, Johanna Mason. The strip scene inside the elevator is one that I remember for years to come. I was surprised to see Jeffrey Wright appear in this film. He gave a subtle, yet intelligent performance as the male tribute for District 3, Beetee Latier. Wright also clicked very well with Amanda Plummer, whose performance as Latier’s fellow District 3 tribute Wiress, struck me as deliciously off-center. Lynn Cohen nearly stole the show as Finnick’s fellow tribute from District 4, Mags. I thought she did a pretty good job, although I am at a little loss over the fanfare regarding her performance. Many seemed to regard “CATCHING FIRE” as superior to the original 2012. I cannot agree with this opinion. I am not saying that “CATCHING FIRE” is a disappointment or inferior to “THE HUNGER GAMES”. But I certainly do not regard it as better. I would say that it is just as good. And considering my very high opinion of the first film, one could assume that my opinion of this second film is equally positive, thanks to an excellent screenplay written by Simon Beaufoy and Michael deBruyn, first rate direction from Francis Lawrence, and a superb cast led by Jennifer Lawrence and Josh Hutcherson. Below is a list of my top five favorite episodes from Season One of Netflix’s series, “HOUSE OF CARDS”, a remake of the 1994 BBC miniseries that was based upon Michael Dobbs’ 1989 novel. 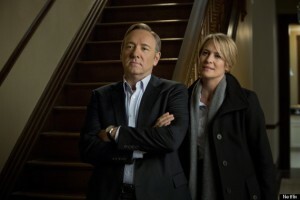 Produced and developed by Beau Willimon, the series stars Kevin Spacey and Robin Wright. 1. 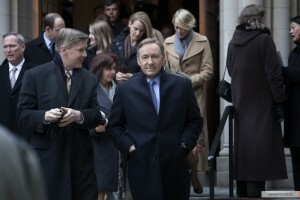 “Chapter Five” – Congressman Frank Underwood’s feud against a union over the Education Bill threatens his wife Claire’s charity gala and her own ambitions. And journalist Zoe Barnes mixes work with play. 2. “Chapter Eleven” – Angry at Frank, Claire reconnects with former flame, photojournalist Adam Galloway. And when junior Congressman Peter Russo wrestles with his personal demons and considers confessing his and Frank’s sins, the latters decides that he has become a liability that needs to be eliminated. 3. 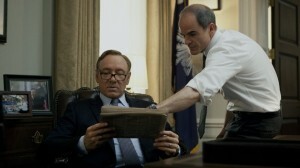 “Chapter Two” – Utilizing Zoe’s help, Frank plants a story that loosely ties Michael Kern, the President’s pick for Secretary of State, to an anti-Israel editorial that appeared in the college newspaper Kern edited. 4. “Chapter Six” – Frank strikes back at the striking teachers by undermining the credibility of the teachers’ union representative, Martin Spinella. Claire is caught off guard by a deathbed confession from one of Frank’s personal bodyguards. 5. “Chapter Thirteen” – Frank accepts the recently vacated Vice-President post from the President. Claire learns that she is being sued for wrongful termination by a former employee. And Zoe becomes increasingly aware of Frank’s plots in this season finale.